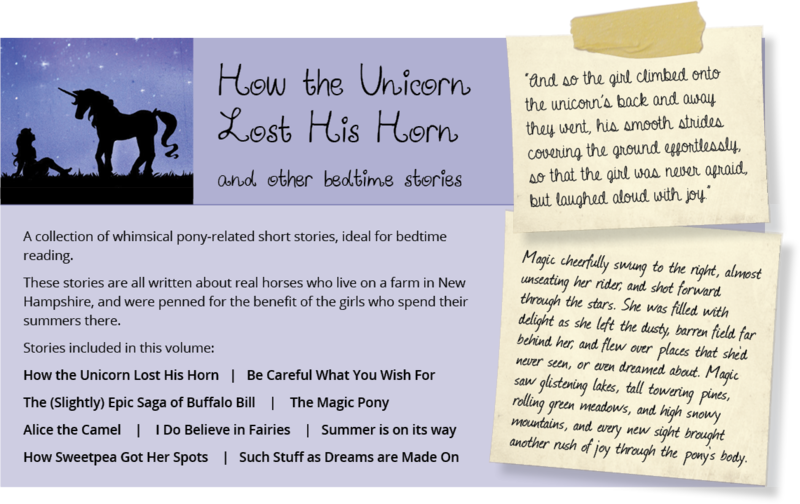 How the Unicorn Lost His Horn – Diamond Dust is a magical but lonely unicorn who discovers the most precious thing in the world – the unconditional love of a little girl. Be Careful What You Wish For – a young girl is given magical crayons that will bring her drawing of her heart’s desire to life – but her artistic ability leaves a lot to be desired! The Magic Pony – an abandoned pony is adopted by a witch who is not as wicked as she seems. The (Slightly) Epic Saga of Buffalo Bill – tells the story of a starving young Connemara pony who dreams of a better life on a ranch in America. Alice the Camel – Alice knows she is the prettiest pony on the farm, but when she overhears her rider saying she’s a camel, she decides to find out exactly what that means. I Do Believe in Fairies – Nobody believes Quint when she says she sees fairies in the pasture, but when she finally has a conversation with one, she learns an incredible truth. Summer is on its way – Alice interviews the other horses on the farm about their anticipation of the coming summer. Such Stuff as Dreams are Made On – the Horse Gods up in the heavens decide to create a perfect horse, but will anyone on earth truly appreciate and understand her? Available as an e-book only. Download for only 99c here. Cover art by Penelope Lattey.